Understanding consumer segments is key to any successful business. Analytically, segmentations involve clustering a dataset to find groups of similar customers. What “similar” means is defined by the data that goes into the clustering — it could be demographic, attitudinal, or other characteristics. And the data that goes into the clustering is often limited by the clustering algorithms themselves — most require some kind of tabular data structure, and common techniques like k-Means require strictly numeric input. Breaking out of these restrictions has been one of our top priorities since starting the company. So what do you do when you want to find segments of customers that are “similar” because they behave similarly — their experience with you, their brand, has been similar. How would you define that? Increasingly, companies are collecting sequence data, with each entry being an interaction with a customer — be it a purchase, reading an email, visiting the website, etc. Given the popularity of deep learning techniques to tackle sequence-related learning tasks, we thought applying neural networks to customer segmentation was the natural approach. This post builds off of our previous customer journey segmentation post and demonstrates a prototype of a deep learning approach to behavior sequence segmentation. We wanted to investigate if we could leverage the internal state of a recurrent neural network (RNN) on complex sequences of data to identify distinctive customer segments. Turns out that we can. And it works well. Our client recorded a behavioral dataset for each customer interaction such as receiving an email, opening an email or using the app, so a single users “sequence” looks like this. Note that each sequence can have a variable number of rows. We developed a very simple neural network architecture which is described below. For this sample of customers, we knew whether or not they had churned by the time the data was collected, so our “X’s” were the sequences of customer behavior, and our “Y’s” were 0/1s depending on if the customer had churned. Therefore we had a sigmoid output layer which predicted either a 0 or 1 and a recurrent input layer, which is able to handle variable length sequences. We included a dense layer to make the network more powerful, and to generate encodings. We used Keras (on R) to specify and train the network. The encodings capture all of the information of the neural network. Although they do not have any inherent meaning we can use them in a clustering algorithm to identify distinct segments. Which is exactly what we did. We decided to run a DBSCAN on the encoded sequence data. DBSCAN had the advantage (in this case) of being able to handle non-linearities in the data and for not needing to specify the number of clusters in advance. K-means performed similarly. The DBSCAN algorithm identifies five distinct clusters with some significant, and valuable differences between them. Although the clusters are fairly imbalanced (likely an artifact of using a supervised clustering technique), the number of days since the first interaction is clearly a strong driver in defining segments. The key takeaway here is that clusters with the highest churn rate have an interaction history of three months or less. This business absolutely must focus on getting customers through the first three months to decrease the likelihood of churning early. We welcome any thoughts or comments you might have, and feel free to share this blog posts with your friends and colleagues! Meet our newest team member, Stefan, from the Netherlands! We can all relate to the thoughts of playing in the Major Leagues when we were a kid. It’s an indescribable feeling when you dream about hitting that near 100 mph fastball out of the stadium. This feeling became my reality as soon as I joined Gradient. The high-profile clients, excellent deliverables developed with meticulous care by using state-of-the-art modeling and analysis techniques make me feel like I’m batting in the MLB! Feelings of uncertainty and doubt about the future are inextricably linked to being a recent graduate. However, after my first week at Gradient, these feelings vanished immediately. I’ve been taken in as if I was a long-lost son. At first, the transparency within the company was overwhelming, yet it is quickly becoming my favorite feature. It not only improves internal communication — it also makes me feel that, even after a week, I’m already a fully integrated employee. Alright, enough about my feelings. Let’s talk about what my role as a Quantitative Analyst means for Gradient. But first, let me take you on my academic journey. I started my university adventure at the technical university in Eindhoven (TU/E). Wait, where? Right, I forgot to mention that I’m a Dutch citizen. I’ll be generating quantitative insights while sitting in a field of tulips wearing clogs. Anyway, I studied Innovation Sciences. Which is a broad term for everything related to the combination of technology and psychology. Afterwards I finished a more business related master’s degree at the Tilburg University (UvT) in Marketing & Management. As you might know — a data scientist, or quantitative analyst — operates at the intersection of statistics, business and computer science. All these things are right up my alley, and make me into the utility player that Gradient has been searching for. For each new client, I will immerse myself into their business and understand their underlying goals, motivations and opportunities. Once we have developed a hypotheses, obtained the required data and transformed the information into a usable format, I’ll get cracking on developing statistically robust models. Which is where a lot of data scientists call it a day — not me though, and especially not Gradient. We will guide you through our development process and surface meaning from the analysis. Each project will require me to learn new techniques and explore new research topics. Not a single day will be the same. One day I might have to code non-stop to finish a sprint, while the other I will be practicing a client presentation in front of the mirror. Variety drives me, be it in my work or in my personal life, I never want to live the same day twice. Working for an international company like Gradient resonates deeply with me. The cultural dynamic is extremely interesting and provides a challenging yet rewarding workflow. On a more personal level I enjoy learning about one’s background and cultural habits. Back in 2010, when I was 18, I went on a life-changing backpacking trip to Australia and New Zealand. Even more of a cultural shock came to me when I followed an internship in Dubai. I’m adventurous by nature and my passion for the outdoors might be an obsession. Climbing in the Scottish Highlands, hiking through the Belgium Ardennes, camping in a French province or actually enjoying an outdoor bootcamp in my local town, ‘s Hertogenbosch. Besides the outdoors, I’ll be listening to music wherever I go. Spending hours on Spotify optimizing a playlist (of course accompanied by a meta-data analysis.) for every single occasion is one of my favorite past-times. Now it is time to start my latest adventure with Gradient. One of the most important steps in building a statistical model is deciding which data to include. 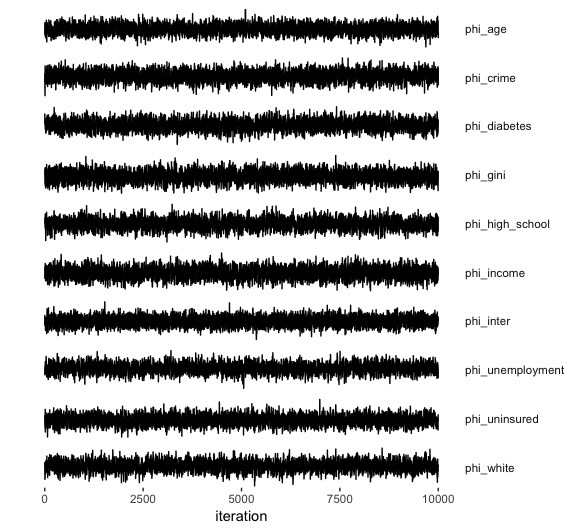 With very large datasets and models that have a high computational cost, impressive efficiency can be realized by identifying the most (and least) useful features of a dataset prior to running a model. Feature selection is the process of identifying the features in a dataset that actually have an influence on the dependent variable. High dimensionality of the explanatory variables can cause both high computation times and a risk of overfitting the data. Moreover, it’s difficult to interpret models with a high number of features. Ideally we would be able to select the significant features before performing statistical modeling. This reduces training time and makes it easier to interpret the results. Some techniques to address the “curse of dimensionality” take the approach of creating new variables in a lower-dimensional space, such as Principal Component Analysis (Pearson 1901) or Singular Value Decomposition (Eckart and Young 1936). While these may be easier to run and more predictive than an un-transformed set of predictors, they can be very hard to interpret. We’d rather—if possible—select from the original predictors, but only those that have an impact. There are a few sophisticated feature selection algorithms such as Boruta (Kursa and Rudnicki 2010), genetic algorithms (Kuhn and Johnson 2013, Aziz et al. 2013) or simulated annealing techniques (Khachaturyan, Semenovsovskaya, and Vainshtein 1981) which are well known but still have a very high computational cost — sometimes measured in days as the dataset multiplies in scale by the hour. As genuinely curious, investigative minds, we wanted to explore how one of these methods, the Boruta algorithm, performed. Overall, we found that for small datasets, it is a very intuitive and beneficial method to model high dimensional data. Below follows a summary of our approach. Why such a strange name? Boruta comes from the mythological Slavic figure that embodies the spirit of the forest. In that spirit, the Boruta R package is based on ranger, which is a fast implementation of the random forests classification method. We assume you have some knowledge of how Random Forests work—if not, this may be tough. Let’s assume you have a target vector T (what you care about predicting) and a bunch of predictors P.
The Boruta algorithm starts by duplicating every variable in P—but instead of making a row-for-row copy, it permutes the order of the values in each column. So, in the copied columns (let’s call them P’), there should be no relationship then between the values and the target vector. Boruta then trains a Random Forest to predict T based on P and P’. The algorithm then compares the variable importance scores for each variable in P with it’s “shadow” in P’. If the distribution of variable importances is significantly greater in P than it is in P’, then the Boruta algorithm considers that variable significant. The dataset of interest here were records of doctors’ appointments for insurance-related matters, and the target variable of interest was whether or not the patient showed up for their appointment. Part of our task was to find the most significant interactions, and with fifty jurisdictions and thirty doctor specialties, we already have a space of 1,500 potential interactions to search through—not including many other variables. The set of features can be visualized by creating a set of boxplots for the variable importances for each potential feature. The three red boxplots represent the distribution of minimum, mean and maximum scores of the randomly duplicated “shadow” variables. This is basically the range of variable importances that can be achieved through chance. The blue bars are features that performed worse than the best “shadow” variables and should not be included in the model. Purple bars are features that have the same explanatory power as the best “shadow” variable, and its use in the model is up to the discretion of the analyst. The green bars are variables with importances higher than the maximum “shadow” variable — and are therefore good predictors to include in a future classification model. Businesses often want to better understand their customers by segmenting them along a common set of attributes. In a previous post, we explored how to build segments based on customers’ trajectories of interactions with a brand. In this post, we’ll show how to build segments based purely on the products that customers have purchased; this approach has the added bonus of not just segmenting your customers, but your products too! And this isn’t just a strategic intelligence tool—finding groups of similar customers can lead to advanced recommendations systems that are personalized for each one of your customers. How one can find groups of similar customers that purchase similar products? How do we define what “similar” means in an assortment of thousands (or tens of thousands) of SKUs? Flip the question on its head: how do we find products that are purchased by similar customers? How do we define similarity between customers? As you’ll see—asking either one of those questions individually is a bit like asking which blade of the scissors cuts the paper. In a product segmentation, customers are said to be similar when they purchase from the same set of products; and products are similar when they are purchased by the same set of customers. Ok—let’s dive into how it’s done. To keep things really simple, we’re going to put a 1 in the cell if the customer has ever purchased that product, and 0 if they never have. Again, let’s remember that we’re trying to explain this data in terms of customers (rows) and products (columns)—sounds like we’re trying to split this matrix in two! In fact we are—the tool that we use to explain our observed data is called non-negative matrix factorization. It is a group of algorithms that simplify the original matrix of data (let’s call it V) by 2 other matrices (W and H), which, when multiplied together, come to (approximately) the original matrix. This would mean that for each customer, you have two pieces of information that tell you what kinds of products they purchase (instead of 1,000); and for each product, you have two pieces of information that tell you which kinds of customers purchase them. This approach can be thought of as a multidimensional scaling algorithm that has better features than Principal Component Analysis as it is well defined for non-negative values in the data (and counts of purchases are always non-negative). Where CS1 is that customer’s score for segment 1, and PS1 is that product’s score for being in segment 1—and so on through to segment 5. So if a customer and product have high scores for the same segments, then our factorization is implying that this cell in the customer-by-product matrix has a high value. Visually, the results can be shown in the form of a heatmap, which shows each customer’s score by each segment (the charts below use the word “basis” in lieu of segment). Now we have the two pieces of information together—the customers that tend to purchase similar products, and the products that tend to be purchased by similar customers. If you’re interested—check out our code-through here. Working through such an analysis, a common challenge is having a very sparse dataset. Typically there are many products, and customers tend to only purchase a few of them. This can usually be addressed by applying some expert knowledge to develop a hierarchy of information about the product—from brand, to style, to size (or SKU), and choosing the appropriate level of the hierarchy to use. In addition, non-negative matrix factorization takes a number of options and parameters—there a number of different algorithms and choices to make for each. One needs to determine which loss function to use and how to determine the starting state of the matrix in the estimation process. Not to mention, you have to choose the number of segments for your analysis—this is typically done by trying a range of possible segments and comparing how well they explain the data (by comparing their errors) and how well they perform for you, the analyst. Too many segments, and the information is hard to digest; too few, and you are not explaining the data well. Finally, the computations are expensive and tricky. We use the NMF library in R, which is as performant and flexible as they come—but even still we often encounter tricky and hard-to-diagnose errors all the time. Christie’s Auction House is a landmark institution in New York City and across influential capital cities. Every few weeks, in the run-up to one of their famous auctions, you can waltz right in and enjoy museum quality artwork enjoying a brief public interlude before it disappears back into private hands. Only a few weeks ago, I was in the midst of Lichtensteins, Chagalls, and Basquiats on their two week vacation in the public eye. In these halls, listen carefully and you can hear the whispers of brokers advising their wealthy clients — which more often than not contains an evaluation of the direction of the art market. But how good are these predictions? Can we do better with data? One thing we love to do at Gradient is to push our skills with novel, underutilized datasets. A few weeks ago, we got the bright idea of applying statistical techniques to an unlikely recipient of quantitative techniques: fine arts. The proof-of-concept project outlined below presented an opportunity to exercise a few core competencies of intense interest to our clients: assembling bespoke datasets through web scraping and building statistical models with unstructured or semi-structured data. From this proof-of-concept, we also uncovered a valuable case study in the value of regularization. $ lot : chr "802"
$ title : chr "A SMALL GREYISH-GREEN JADE 'BUFFALO’"
$ subtitle : chr "LATE SHANG-EARLY WESTERN ZHOU DYNASTY, 12TH-10TH CENTURY BC"
$ details : chr "Provenance\r\n The Erwin Harris Collection, Miami, Florida, by 1995." $ saleid : chr "12176"
We downloaded every lot sale from 2017 — a set of 11,577 observations. For predictors, we decided to use the abundance of text contained in the dataset. To add some structure to the text, we tokenized the “bag of words” for each sale item, and included only words that were used between 50 and 200 times. This type of dataset is standard in text mining approaches and is called a document-term matrix, where each “document” is a row, and each possible “term” — typically, a stemmed word — is a column, with the number of times that term appears in a given document in the respective cell. Our first model was a simple linear regression with the document-term matrix as the set of predictors and our Box-Cox-transformed price-to-estimate ratio as our target vector. What did we get? A data scientist’s dream come true! You see that R-squared? 0.96!! And let’s come back to that 0.96 R-squared! This is obviously a case of overfitting — in real life we should not expect to be able to predict the actual price of a sale with that kind of accuracy. If we tested this model on data that we did not use to train the model, would we really expect to get it this right? In addition, this kind of naïve model gives us almost no insight into what words are significant predictors of actual sale price. With 1,526 predictors, we’d have a lot of data to sort through even after we’ve run the analysis. What’s the solution to all of these issues? Regularization! 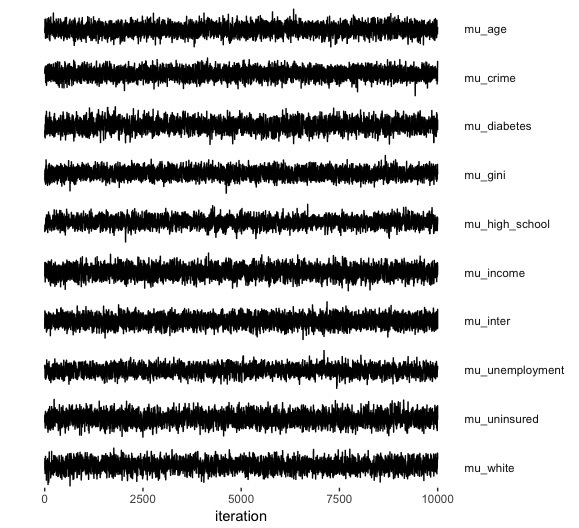 We love the L1-norm (or LASSO) for regularizing our regression models. In addition to regularizing the model by ensuring that it is applicable to data the model has not yet seen, it also helps make sense of very “wide” datasets — like those with over 1,500 predictors — by shining a light on only those that have a significant impact. By imposing an extra penalty on coefficients, it zeros out coefficients that have no significant impact and restricts the size of those that are non-zero. Using cross-validation that repeatedly trains a model on sample of a databse and testing it on the held-out portion, we can tune the regression model to pick the exact combination of predictors that maximizes the penalized fit. Although this is a busy graph (we did have 1,500 predictors after all), this shows that as we increase the penalization (lambda), more and more coefficients shrink and ultimately become zero. At the value of lambda that we selected through cross validation, there are roughly 40 words that actually have some predictive power. Some predict a price higher than the actual, and some predict a lower price. Positive indicators. If you see these words in the description, bid high. Oh, and what was our R-squared? Nothing close to 0.96! This model had a pseudo R-squared of around 0.14. Smaller? Yes, but certainly more reflective of the predictive power of the words in the objects’ descriptions. So, is 0.14 good or bad? Depends on your perspective! In financial markets an R-squared even ever so slightly above zero has huge value, as any kind of edge can make you millions. This kind of model probably could not be used to reliably inform purchase decisions at auctions, but it certainly raises good questions for the astute art observer: why does the word “warehouse” int he description predict a higher than estimated value? Are watercolours disrespected by the experts but then preferred by buyers? Any discerning buyer should be asking these questions. We then built a number of binary classifiers to predict whether or not the object exceeded the high end of its predicted price range. There were 365 tags that appeared for at least two images — these tags were used as the predictors in building a classifier. We plot the most popular tags across groups. We were surprised that the counts for the group that underperformed were so low, and that some fairly common words, like “vase”, “small”, and “group” appeared only in group 1. (A puzzle, for sure!). So much more could be done to improve these models. Certainly we could go much further than the works sold in 2017. We could look for lots sold in more than one auction and build a model to account for changes in price over time. We could build a regression to isolate the performance of certain auction locations — like New York, London, and Hong Kong, or test performance measures between live and online auctions. As a short internal project, this was really fun, and shows what the Gradient team can do with a novel source of data in a few days. Like what you see? Get in touch. As Gradient’s newest employee, I’m thrilled to be working with such a talented crew on some fascinating assignments. Admittedly, I was a little intimidated by the abundance of brains and expertise, but we have quickly developed a strong camaraderie and settled into a productive cadence. In the first few days alone, I’ve come to appreciate the responsive and efficient approach with which Gradient approaches research. Having had the opportunity to design and execute research for a diverse set of global clients, I know first hand that a lean and flexible research design is essential to getting clients the exact data and analysis they expect. I’m no stranger to quantitative research, having spent the past 7 years in various capacities using data to help managers make important decisions. I love seeing how the combination of the right research question, data, and targeted analysis can uncover a completely unexpected finding that changes the direction of an initiative, campaign, or upends an established hypothesis. It’s even more gratifying to work on projects with so many different applications, from learning how Sesame Street programming helps young children learn in a developing country to mapping how the population in an upmarket neighborhood has changed over time and investigating the drivers behind it. I feel way too fortunate that I get to spend my days (and the occasional night) learning about people and their habits, motivations, triggers, emotions, and relationships. I used to tell myself that I “understand” people, but I continue to be surprised and have my assumptions overturned, so I’ve learned to approach every new project with a fresh perspective and no expectations. While Gradient already has an impressive lineup of brainpower and fascinating clients, I hope to draw upon my diverse experience in emerging markets where the growing consumer class is not well understood. Thanks to mobile phones, the marketing tools and mediums available to emerging markets are not drastically different from those of more established economies. That said, the way in which marketers appeal to this new wave of consumers requires foregoing all prior assumptions and investing in extensive formative research to appreciate the values of a new culture before you can even begin to think about analyzing a dataset. I’d like to help Gradient glue together the cultural context and high-level analytics to ultimately produce analyses that are statistically rigorous but not blind to their surroundings. I’m also a lover of maps (see below) and commonly think the best way to make a point that nobody can refute is to toss your arguments on a map. Too often we overlook the importance of spatial relationships and how our environments affect us. There are many promising applications of spatial analysis that I’d love to incorporate into Gradient’s standard methodology, such as analyzing the performance of our predictive models by ZIP code or neighborhood. I feel quite fortunate that my professional and personal interests align quite nicely, which is a good thing, right? I’m a super adventurous traveler. I’ll go anywhere — the more far-flung, bizarre, unheard-of place the better. I’ve been to more than 40 countries and enjoyed (with one exception) every single one — you can ask me which one over a beer. When I travel, I’ll eat or drink anything and prefer to spend at least one full day with no map (which is hard for me!) and just a good pair of walking shoes to truly get a sense of a new place. My ideal Saturday is one spent exploring a city on foot with no itinerary or objective. I just graduated from The University of Pennsylvania with a MS in Spatial Analytics, which might sound like years of misery for some, but was as close to academic heaven as I could get. Full disclosure: I really like maps, I can’t get enough of them. So much so that I have a designated map wall at home and have spent enough time staring at satellite imagery that I can recognize the footprint of pretty much every major city in the world. Thankfully everyone at Gradient embraces nerdiness, so I can be open about my strange obsessions. At Gradient, we all have them, I assure you! Introducing Team Gradient’s newest member was originally published in Gradient on Medium, where people are continuing the conversation by highlighting and responding to this story. Now let’s imagine we flip one of these coins 100 times. What is the probability that it comes up heads 50 times? Even if the coin is fair (p = 0.5), just by random chance it may come up heads only 40 times, or may come up heads more than you’d expect – like 60 times. It is even possible for it to come up 100 times in a row, although the odds of that are vanishingly small. And if alpha is the amount of “pushing” to the right and beta is the amount of “pushing” to the left in the distribution, then phi is all of the pushing (either left or right) in the distribution. This is a sort of “uniformity” parameter. 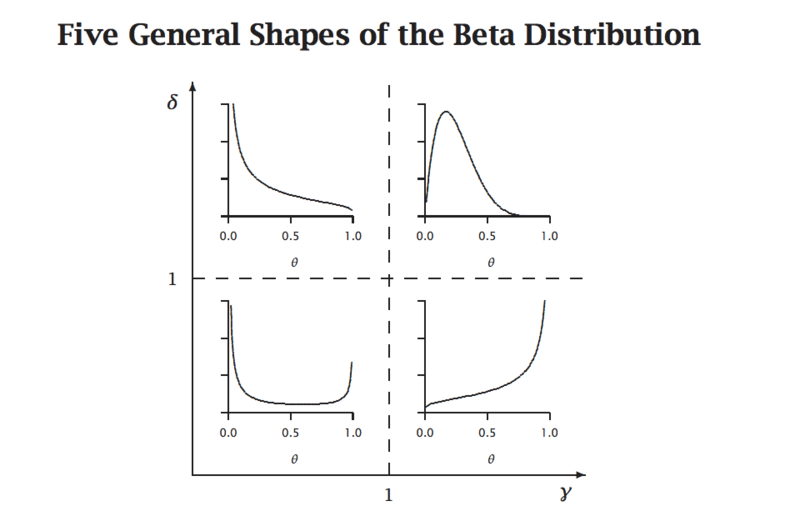 Large values of phi mean that almost all of the distribution is near the average (think the upper right beta distribution above) – the alpha and beta are pushing up against each other – and small values of phi mean that almost all the values are away from the average (think the beta distribution on the lower left above). We could even match voting records across the ’12 and ’16 elections to make inferences about the components of the county-level vote swing: voters flipping their vote, voting in ’12 and not voting in ’16, or not voting in ’12 and then voting in ’16 – and which candidate they came to support.